As spring weather was beginning to get a foothold in the Chamonix Valley, the CREA Mont-Blanc was joined by members, partners and friends for its annual meeting at the Mont-Blanc Base Camp. 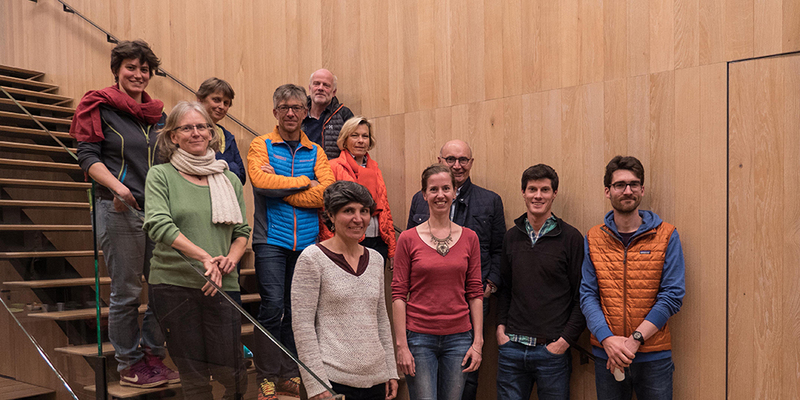 Around 40 people were present to celebrate 2017’s successes (including the reception of the United Nations Momentum for Change Award) and to learn about new opportunities to get involved in studying the Mont-Blanc massif’s biodiversity. 2017 was a full year for CREA Mont-Blanc. With pride in his voice, CREA Mont-Blanc Vice President, Richard Raquillet opened the General Assembly reminding the audience that CREA Mont-Blanc received recognition from the United Nations. The Momentum for Change prize, awarded at the COP 23 in November, recognized the innovative technological and human partnership between CREA Mont-Blanc and the telecommunications company Orange. 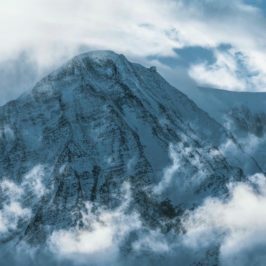 The CLIMB project (Climate Change Impacts on Mountain Biodiversity) was created to allow for more efficient and effective monitoring of how mountain environments are responding to climate change. The major theme of the evening was citizen science, one of CREA Mont-Blanc’s principal activities. Program Director, Irene Alvarez presented the different citizen science projects (TourScience, Phenoclim, and the Mont Blanc Atlas) that CREA Mont-Blanc uses to bridge the gaps between citizens, regional actors and research. Constantly innovating and trying new things, the CREA Mont-Blanc team challenges itself to move beyond classic techniques for implicating the public. 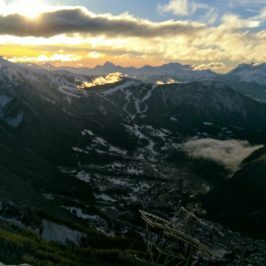 Climate Science in Chamonix, a new initiative aiming to bring American university professors and students to Chamonix to learn fieldwork techniques and how to independently design experiments and collect data. The CREA Mont-Blanc team is excited to discover how this new collaborative multidisciplinary approach will offer a fresh perspective on their work. 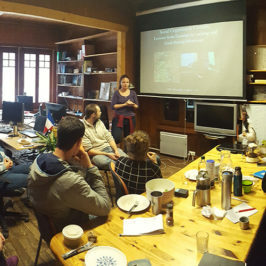 In October of 2017, CREA Mont-Blanc hosted another exciting event: the Mont Blanc Lab, a collaborative marathon bringing together 50 people from diverse backgrounds to develop prototypes of new ways to share knowledge and highlight the area’s natural heritage. Over the course of 3 days, 6 teams produced six prototypes. Innovative and interactive, their proposals mixed physical creations (board games, kiosks, and interpretive paths) with digital innovations (virtual reality and mobile applications). 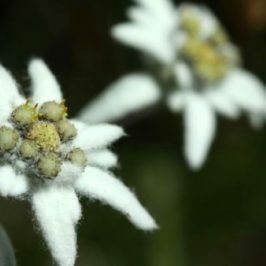 CREA Mont-Blanc tried its hand at this new form of citizen science in which people get involved not only in data collection but also in the sharing of data and results, and the result was a success! The participant’s creations were presented to the community and local decision-makers who attended the event’s public restitution. 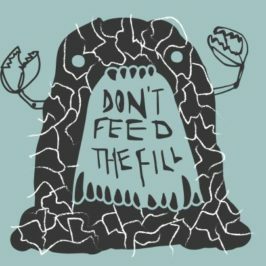 A second edition is scheduled for the fall of 2019. Marjorie Bison gave a presentation of Phenoclim, a program to which citizens have contributed nearly 33,000 observations since its launch in 2004. The program aims to improve our understanding ecosystem functioning through careful observation of seasonal phenomena and the consequences of climatic variation on the environment in different mountain ranges. Phenoclim groups together data collected through a variety of different fields including phenology (seasonal flora and fauna phenomena), climatology (temperature variation) and even social sciences (Marjorie recently published a study on the reliability of citizen science data). Brad Carlson presented his research using the Sentinel 2 satellite data to monitor vegetation and snow cover in the Mont-Blanc massif. The satellite is equipped with advanced technology that allows researchers to precisely analyze the different characteristics of an area (rock, water, snow, vegetation, etc.) and monitor the inter-annual variation and changes. By combining these high-tech measurements with field observations, Brad is able to examine the effects of climatic variations on mountain environments. 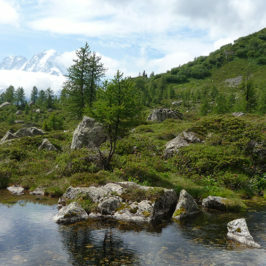 For example, this technique allowed us to determine that, among the wetlands studied by CREA Mont-Blanc, 40% dried out entirely during the summer of 2017, compared with 33% in 2016, with obvious consequences on the surrounding flora and fauna. 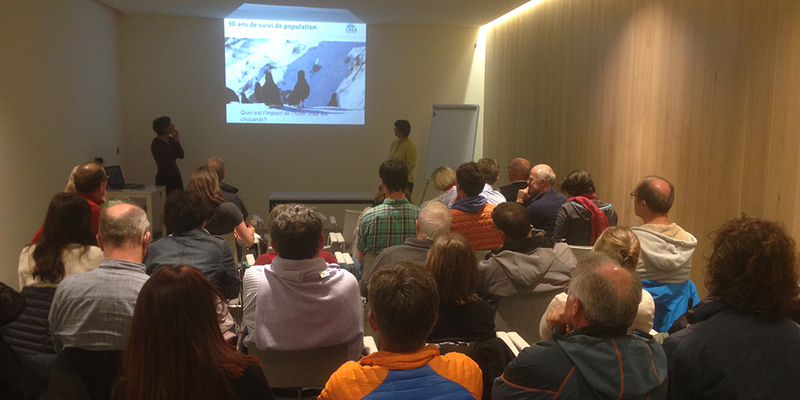 The final subject at this year’s General Assembly presented by CREA Mont-Blanc’s founder and director, Anne Delestrate, who shared her 30 years of work on one of the mountain’s most recognizable species: the Alpine chough. Her research has included studies of the chough’s distribution, social behavior, reproduction, and survival rates. A thesis is currently being completed on survival rates and a corresponding article will soon be published. To kick off the informal part of the evening and potluck buffet, Colin Van Reeth, the newest addition to the team, launched a call for volunteers to join the team for a wide variety of activities from collecting observations to installing monitoring equipment to participating in data sharing and awareness campaigns. CREA Mont-Blanc is always looking for mountain lovers interested in contributing to their research on biodiversity and climate change. It is thanks to the participation of volunteers and partner’s that 2017 will go down as one of CREA Mont-Blanc’s most successful years on the books. Stay up to day on our research and events when you sign up for our newsletter (in French).